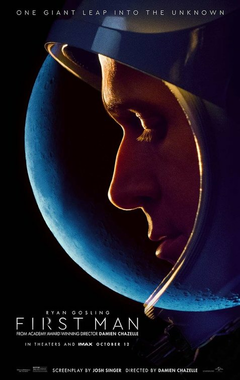 The Moon is a very apt goal for First Man, the biopic of Neil Armstrong. Like the film, the Moon is a beautiful object but very cold and distant, something to admire from afar but something we cannot embrace. Covering the years 1961 through 1969, we see Neil Armstrong (Ryan Gosling) work. He and his wife Janet (Claire Foy) live through the death of their young child Karen, later on having a second son, and Armstrong's slow and steady work in the NASA program to eventually have a man on the Moon. Through that, he passes through the various setbacks of the NASA Gemini and Apollo programs ranging from training and various mechanical failures to the Soviets constantly beating them. He also passes through the deaths of his fellow astronauts Edward White (Jason Clarke) and Gus Grissom (Shea Whigham) on Apollo 1. Finally, he passes through the somewhat obnoxious manner of his Apollo 11 teammate Edwin 'Buzz' Aldrin (Cory Stoll) before finally setting foot on the Lunar surface. There, he quietly pays tribute to Karen and returns home, where Janet sees him while he's in quarantine. First Man makes me think of the axiom 'It's about the Mission, not the Man' for the film does not seem to be interested in delving into who Neil Armstrong is. Rather, as a chronicle of the frustrations and eventual success of the NASA program, First Man is indeed first-rate. Director Damien Chazelle has simply wonderful moments which are intense and gripping. The opening sequence where we see Armstrong first skimming the Earth's atmosphere in an early test is surprisingly tense even though we should know he is going to survive. The launches and the final Apollo 11 sequences where the crew is both pushing off from the bonds of Earth and taking those historic leaps for mankind are breathtaking in scope. They are grand without being overwhelming, at times putting the viewer in a 'you-are-there' manner that leaves one almost breathless. These moments are enhanced by Justin Hurwitz's score. I noted influences from Offenbach's Tales of Hoffmann (specifically the Barcarolle) and Wagner, Hurwitz's music matches the scenes so well. It can be bold, but mostly it is ethereal, sometimes with just a harp. Chazelle draws heavily from 2001: A Space Odyssey in First Man, particularly in the visuals where we see these lonely spacecrafts floating through the emptiness. In these moments, we see the beauty and power of space. Once we're on Earth though, Armstrong remains aloof, distant, almost inhuman in his demeanor. Gosling is the perfect man to play this version of Armstrong. Gosling is the master of the blank, emotional-less stare, an actor who consistently mistakes lack of smiling with deep emotions. 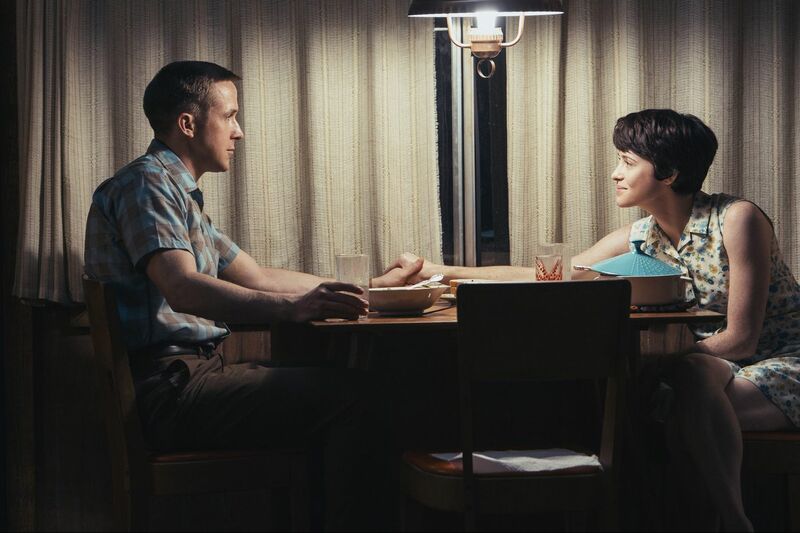 Gosling's Armstrong is a man who is capable of feeling, albeit alone. He must cry for his dead daughter alone. At one point, he storms out of a funeral luncheon and another snaps at another memorial about not wanting to mourn with others. Neil Armstrong is the NASA Greta Garbo: He Wants To Be Alone. Therein lies an issue: this Neil Armstrong is unknowable, a shadow floating through this life. He does have moments of humanity, like a scene where he romps with his boys. However, Josh Singer's adaptation of James R. Hansen's biography at times is too blunt with how it paints Armstrong as a man not in touch with human feelings. During his daughter's illness, he pours over his notes of her various treatments. Singer and Chazelle also structure Neil's final conversation with his boys before going into flight as a de facto press conference. At one point, he asks, "Are there any other questions? ", which would have worked save for the fact that we had an earlier scene that was a press conference. I know they were going for a parallel. I don't think they had to be so obvious about it. As a side note, it is interesting that Aldrin came off almost as the villain in First Man. I wondered if his nickname should have been "Buzzkill" given how often he seemed to be a naysayer or worse, an annoyance for the stoic, cold Armstrong to endure. Foy had one mode: angry. Whether she was angry at the kids, angry at NASA for how they ran things or angry at Armstrong for not addressing the possibility of death, Foy too seemed to make Janet into a morose figure. Fewer marriages were as dour as the Armstrongs. When the film ends with Neil in quarantine, the two of them separated by glass, it was a perfect metaphor for their lives: him bubbled up away, she within sight but just out of reach. I figure the metaphor was deliberate, but again to my mind a touch heavy-handed. First Man is visually impressive but gives us little to nothing about The Man himself. He seems almost incapable of human emotion. I actually would not mind seeing a Buzz Aldrin biopic over this Neil Armstrong biopic. Buzz may be a bit bonkers, but unlike Neil, he has a personality.